Damascus Chef's Knife is the most versatile and essential of all chef knives perfect for dicing, slicing, and chopping fresh produce to carving a roast chicken straight from the oven. 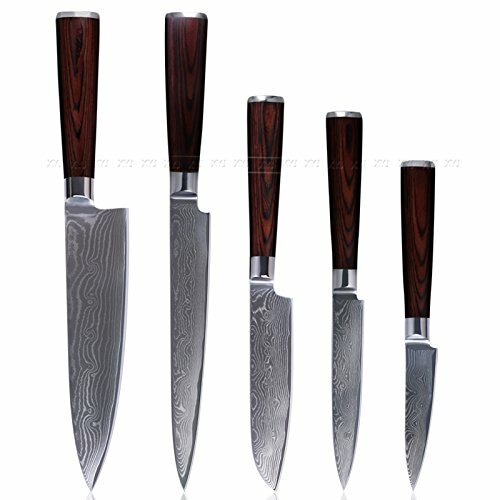 DAMASCUS STEEL: These layers create an exquisitely beautiful steel blade with a unique, granular texture that prevents foodstuffs from sticking to it. MADE FOR PROFESSIONALS: High Carbon Japanese 67-Layers of VG-10 Damascus Stainless Steel to provide with the best and long-lasting edge. Exceptionally durable and perfectly balanced knife to improve performance, reduce fatigue and facilitate precise control for professional use. Resistant to stains, wear and corrosion. If you have any questions about this product by XYJ, contact us by completing and submitting the form below. If you are looking for a specif part number, please include it with your message.